Soccer Fans Scrap Sports Commentary For Organ Music Berlin's streets came to a halt as Berliners squeezed themselves into neighborhood bars to watch the European Soccer Championship. But at Lausitzerplatz in Kreuzberg, Emmanus Church was the main attraction. Stephen von Bothmer, one of Germany's leading silent film composers, accompanied the June 22nd football match between Germany and Greece on the organ at Emmanus Church in Kreuzberg. Berlin's streets came to a halt as Berliners squeezed themselves into neighborhood bars to watch the European Soccer Championship. But at Lausitzerplatz in Kreuzberg, Emmanus Church was the main attraction as visitors and international guests filled the pews to watch the June 22nd match between Germany and Greece on a big screen TV. 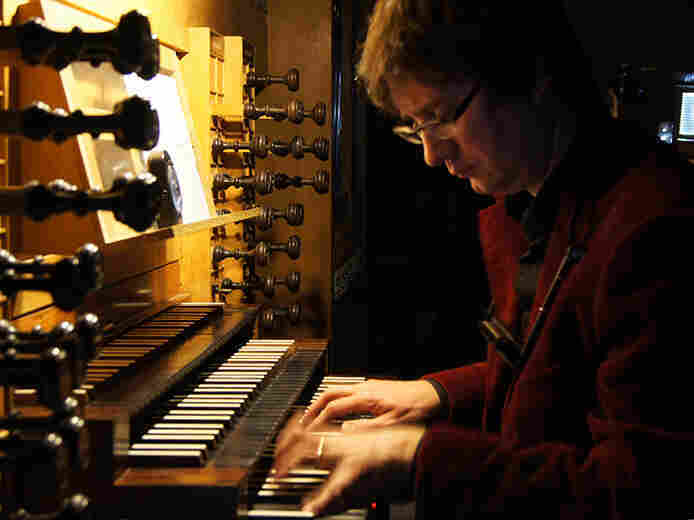 The game was accompanied by organ music by Stephan von Bothmer. Von Bothmer is Germany's leading silent film composer. He is known for his sold out silent film performances at iconic venues like the Berliner Dom and Babylon Theater. The composer says he is on a quest to bring silent film back into mainstream entertainment. Rather than spend hours scoring and writing charts, he composes his accompaniments on the spot. "I call it going onto stage lively. I think a lot about the movie. I play a lot to the movie, and afterwards, I try to forget everything. Then I go on stage, and I sit down at the piano, and I think, 'Well, how do I start?'" In 2008, the Emmanus Church was looking for a way to bring the community together for the 2008 Soccer Championships. Their choir leader had heard von Bothmer perform and had the idea to fuse soccer with organ music. "Now let's take a silent movie which nobody knows before- which is the soccer game," von Bothmer says. "I decided to make it dramatic music like if it would be a Hollywood movie where a big football player has the main role, and the main part would be the game. What film music would they do? They would make tension music I think, so they don't translate everything that happens in the picture into music but they have the tension, and it's always pushing forward." The event was such as success that it became a tradition. For this particular game, Berlin radio station Radio Eins whisked von Bothmer away for the first 15 minutes for a live on-air performance to the beginning of the match. The audience at the Emmanus Church cheered when von Bothmer finally arrived and scurried up to the organ looking happily disheveled. "I thought, 'Let's just make a small musical change whenever somebody else gets the ball like shift the harmony, speed up the rhythm.' I discovered that sometimes they change ball every four or eight beats. Yesterday, with the German team, it worked right away and I knew 'Wow, they are in the rhythm.' But after the break, it didn't work with the German team, but it worked with the Greek team, and it didn't take long for the Greeks to make the first goal. What is really interesting to me is that you can feel in the music in advance if they are in the flow or if they are not in the flow." Whether scoring a goal or a film, it seems that timing is everything. "The moment of changing harmony is 10 times more important than the motifs or the melody or the smartness of the accompaniment you are playing."